Glenys Nellist was born and raised in a little village in northern England. Author of Love Letters from God, Little Love Letters from God, and Snuggle Time Prayers, Glenys has a deep passion for bringing the Bible to life for young children. Glenys lives in Grand Rapids, Michigan, with her husband, David. Snuggle Time Psalms by Glenys Nellist is an adorably cute board book for kids! I love the padded cover and back as well as the fact that it's a board book. I learned early on with little ones that board books are best. I love that the book of Psalms has been tied into the simple concepts, rhyming text and adorable artwork throughout. Kids love animals and this book is filled with adorable animals that my kids absolutely love. They often sit and flip through the book just looking at the illustrations while they wait for me to help get their siblings ready for bed. 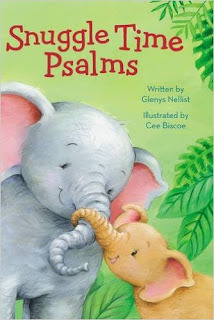 Snuggle Time Psalms by Glenys Nellist is the perfect bedtime book and has quickly become one of my kids new favorites! You can find Snuggle Time Psalms by Glenys Nellist on Amazon, Barnes and Noble and other bookstores.